While the media has been abuzz with push and increase usage of digital wallets, like PayTM, following the government’s demonetization move, we believe the strongest disruption to our payment ecosystem will come from Aadhar. A quick primer on how Aadhar payments will work by considering a typical retail scenario. Let’s say a consumer walks into the store and is about to purchase an item. She needs only her phone (linked to Aadhar) and to have her bank account linked with the Aadhar number. The retailer plugs a biometric device (like a fingerprint reader) to his smartphone, fires up his app, prepares the invoice, asks the consumer to enter her Aadhar number and then scan her finger on the fingerprint reader. 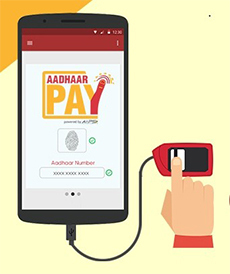 The system will immediately authorise a check of the funds with the linked Aadhar account and on confirmation (likely with an OTP pin) the cash will be immediately transferred to the Retailer generating an electronic receipt. The Aadhar channel will have zero merchant commission no matter how small the payment. Merchant commission is a thorny subject for small retailers, especially in kirana stores with low margins. Today commissions range from 0.5% to 1.5% depending on whether a debit card, wallet or credit card is used and the volume of the transactions. Merchants can sign up as business correspondents. Using this model the retails can earn commissions depending on certain customer actions, like depositing money into accounts, opening term deposits or savings accounts. This provides an additional income to retailers and relieves some of the distribution and capex challenges faced by banks in trying to expand their reach. Less complexity means less risk. The Aadhar payment is simply an inter-account cash transfer without an intermediary. In the case of debit cards the intermediary is Visa, MasterCard or RuPay and in the case of wallets, it’s the wallet companies themselves. True cashless channel for the unbanked. Since all this channel requires is just three things, a savings account (zero-balance Jan Dhan accounts will work), a mobile phone (a feature phone will do) and an Aadhar number; this is a channel that can be truly adopted by all consumers with no additional devices, accounts or phone downloads necessary. Every bank in India is working on plans to launch Aadhar payments. This was already on the roadmap and has recently received a boost from last November’s demonetization event and the general push towards cashless transactions. We expect this payment mode to come of age in 2017.